The R&S®VSE-K10 measures GSM, EDGE, EDGE Evolution and VAMOS signals in line with standards (3GPP TS 45.005, 5.010 and 51.021). The test limits for the spectrum due to modulation and switching transients as well as the test limits for power versus time are automatically configured in line with the standard. After configuring the device type and class (e.g. normal BTS or small MS) as well as the power control level (PCL) used, the application delivers pass/fail results. The modulation accuracy table is derived from the selected slot in the capture buffer and provides a quick overview of the most important numeric parameters. 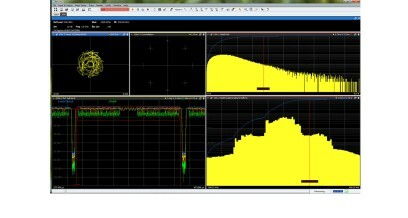 Additional measurements such as phase or magnitude error versus time or EVM versus time and the constellation diagram provide enhanced analysis capabilities.